Over Christmas break I pulled a sweet, tattered piece of paper out of the cabinet where it has been taped ever since September of 2007. Claire was stuck, and she needed a little nudging as she sat pondering what to write for one of three essays she had to work on for her high school applications. As a little background, in our school district, some eighth grade students apply to different specialty centers which focus on areas of interest to them as they move into high school and beyond. Claire’s top choice for high school is the education and human development school where she has the chance to immerse herself in an area of extreme interest and passion. I posted this picture to my Facebook wall yesterday, a little stunned that a seven year-old piece of paper could be the premise for Claire’s high school applications. Her fabulous first grade teacher passed these papers out during the first week of school. She had her students decorate them and bring them home to show their parents. I still remember when Claire brought these words home. I remember how very proud she was of them and what they meant. “Mrs. Hodges number 1 rule…Never hurt anyone on the inside or the outside.” She signed it, “Love, Claire”. She was so enamored of her teacher. Mrs. Hodges was her role model and if anyone could make these words ring true, Mrs. Hodges could do it. These words have stuck with Claire since then, still hanging in the very spot she picked out for them when she first brought them home. These are the words that clinched it for Claire. This is what lead her to want to pursue education. She has wanted to be a teacher since she was in first grade with Mrs. Hodges. And as she pondered what to write about for her essay, this kind rule popped into my head when I read the prompt for the education center. It asked for an experience the student had in the past that impacted them positively or negatively and how they responded to it. This rule fit in perfectly with what Claire wanted to say in her essay because it was given to her by one of her favorite teachers and it embodies what she believes about how teachers should lead their classes. 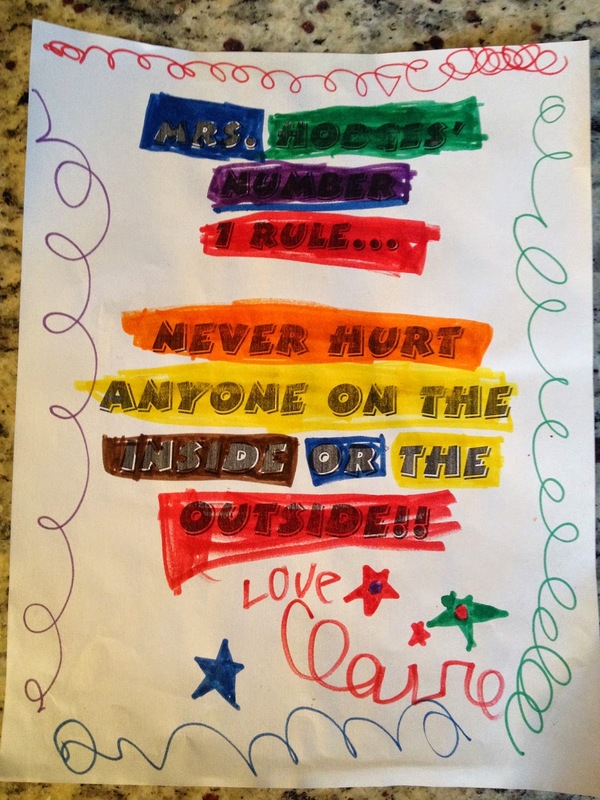 This rule was ingrained in Claire during her first grade year and beyond, and I hope it was reinforced to all three of my kiddos, with my own version of this rule…You don’t have to be everyone’s best friend, but you have to be kind to everyone (and if you accidentally mess this rule up ~ apologize). I absolutely adore these rules. I try hard to live by them and set a good example for my kids. I know I don’t always do a perfect job, but I try hard everyday to do the best I absolutely can. I try hard to avoid hurting other people’s feelings, or brushing people off, or making them feel like they don’t matter. I may not always succeed, but I do work hard at it. I want everyone I come into contact with, the people I love and adore, to always know I would never intentionally try to hurt them on the inside or outside. I want the people in my life to know how much I work to be kind and to teach Zach, Lucas and Claire the same. I want all of us, in this home, to strive to never hurt anyone on the inside or outside.